President Trump and Transportation Secretary Elaine Chao, far right, talk with auto industry CEOs at an event in Michigan last month. WASHINGTON -- Major automakers are set to meet Thursday with the head of the U.S. Transportation Department and Environmental Protection Agency as the agencies begin a review of federal fuel efficiency rules that are a major piece of the climate change policy enacted by the Obama administration. The EPA's emissions standards are also accepted by Environment and Climate Change Canada (ECCC). So, because Canadian fuel economy and emissions regulations follow those of the United States, any changes would more than likely affect the vehicles sold here. U.S. Transportation Secretary Elaine Chao and EPA Administrator Scott Pruitt will meet with board members Alliance of Automobile Manufacturers, a trade group representing General Motors, Toyota Motor Corp., Volkswagen AG, Ford Motor Co., Fiat Chrysler Automobiles, Daimler AG and others, three people briefed on the matter said Wednesday. An alliance spokeswoman declined to comment Wednesday, while the EPA and the Transportation Department did not immediately comment. In March, President Donald Trump ordered a review of U.S. vehicle fuel-efficiency standards from 2022-2025 put in place by the Obama administration, effectively reopening a process the Obama administration had ended ahead of an April 2018 deadline. In 2011, Obama said the rules would save motorists $1.7 trillion in fuel costs over the life of the vehicles, but cost the auto industry about $200 billion over 13 years. Automakers have said that cost estimate is low. California regulators, who had worked with the Obama administration on the current national fuel efficiency standards, have opposed weakening the rules. California has threatened to pursue tougher standards unilaterally and could mount a legal challenge. New York has also threatened a fight if the Trump administration rolls back the Obama standards. 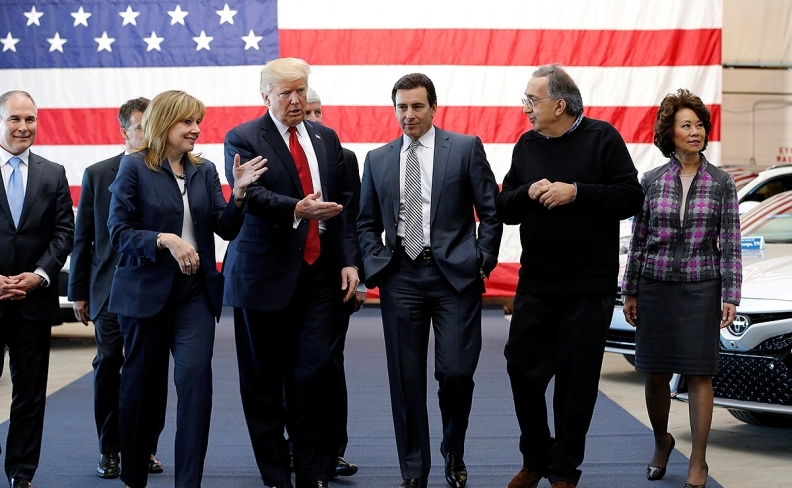 Earlier this month, Mitch Bainwol, chief executive of the Alliance of Automobile Manufacturers, said automakers hope to reach a deal with California and the Trump administration over vehicle fuel efficiency standards. Automakers want "rational, predictable, stable policy," not a rollback of the existing standards, Bainwol said. The White House plans to hold negotiations with car companies and California over the fuel rules, but none have been scheduled since Trump met with automakers in Michigan on March 15 in a session that included Chao and Pruitt. Automakers need years of lead time to engineer future models and want uniform rules across all 50 states to reduce the cost and complexity of compliance. Without a deal, automakers could be forced to meet one set of standards in California and about a dozen states that have adopted its rules and other rules in the rest of the country. The Obama administration's rules, negotiated with automakers in 2011, were aimed at doubling average fleet-wide fuel efficiency to 54.5 miles per gallon by 2025. Under the 2011 deal, the 2022-2025 model year rules must be finalized by April 2018.